Jewish Preservation of His Writings. Arabian philosopher of the twelfth century; born at Cordova in 1126; died in 1198. Although himself a prolific writer on philosophy and medicine, his chief importance is as a commentator upon the works of Aristotle, and for this reason he is often styled "the commentator par excellence." Like Avicenna, who also commented Aristotle, Averroes wrote an original compendium of philosophy of his author, and, in addition to this, wrote the so-called "Middle Commentaries," which latter follow the text, with, however, the omission of passages here and there; and finally he made a full and copious exposition of every Aristotelian statement, incorporating the sentence indistinguishably with his text. His reputation was so great that his books found their way during his lifetime even into Egypt, where, in 1190, Maimonides made their acquaintance. As a matter of course, Averroes' views frequently conflicted with those of his Mohammedan coreligionists, and his works were therefore extensively condemned and prohibited. It is owing to his Jewish admirers that his writings are preserved to-day, for only in the shape of Hebrew translations or by a transliteration of the Arabic text in Hebrew characters did they escape the fanaticism of the Moors. As to the relation between Averroes and Maimonides, which has frequently been misconceived, it is quite certain that Maimonides can not be called a disciple of Averroes, nor Averroes a pupil of Maimonides. The latter read Averroes' writings far too late to permit of his having used them in his own works. Both, it is true, coincide on many points. Both are strong Aristotelians and energetically opposed to the teachings of the Motakallemin concerning atoms and the non-existence of natural laws. Both deny to the Deity the possession of "attributes." Their theories of the intellect are identical, and both take the same position as regards the relation of faith and knowledge. It has yet to be determined whether these striking resemblances are not founded upon some third or common source not yet discovered. In a letter to his favorite pupil, Joseph b. Judah Aḳnin, dated Cairo, 1190, Maimonides writes: "I have recently received Ibn Roshd's work upon Aristotle, besides the book, 'De Sensu et Sensito'; and I have read enough to perceive that he has hit the truth with great precision; but I lack the leisure now to make a study of it." A passage in a letter to Samuel Tibbon, 1199, in which he recommends Averroes' commentaries, is not quite clear. Less known than his commentaries upon Aristotle are Averroes' own original writings, although they have left indubitable traces upon Jewish thought. 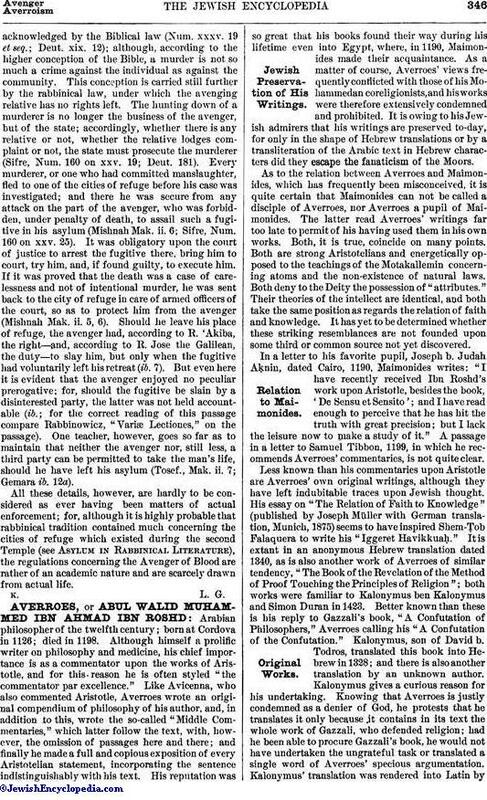 His essay on "The Relation of Faith to Knowledge" (published by Joseph Müller with German translation, Munich, 1875) seems to have inspired Shem-Ṭob Falaquera to write his "Iggeret Havikkuaḥ." It is extant in an anonymous Hebrew translation dated 1340, as is also another work of Averroes of similar tendency, "The Book of the Revelation of the Method of Proof Touching the Principles of Religion"; both works were familiar to Kalonymus ben Kalonymus and Simon Duran in 1423. Better known than these is his reply to Gazzali's book, "A Confutation of Philosophers," Averroes calling his "A Confutation of the Confutation." Kalonymus, son of David b. Todros, translated this book into Hebrew in 1328; and there is also another translation by an unknown author. Kalonymus gives a curious reason for his undertaking. Knowing that Averroes is justly condemned as a denier of God, he protests that he translates it only because it contains in its text the whole work of Gazzali, who defended religion; had he been able to procure Gazzali's book, he would not have undertaken the ungrateful task or translated a single word of Averroes' specious argumentation. Kalonymus' translation was rendered into Latin bya Neapolitan physician, also named Kalonymus ben David, and published in Venice, 1527. This "Confutation" contains a few contradictions of statements made elsewhere by him, but such inconsistencies are by no means infrequent in other writings of Averroes. The change of views thus evidenced gave rise to the legend that Averroes had embraced Judaism, Christianity, and Mohammedanism in succession, and that he wrote the notorious work, "De Tribus Impostoribus." In similar strain is the assertion by a writer of the seventeenth century, that the "Confutation of the Confutation" was actually written by Gazzali himself, who thus secretly furnished a defense against his own attacks upon philosophy, these attacks having been prepared at the command of a fanatical king. Be all this as it may, Averroes' importance as a philosopher was universally acknowledged by Jewish thinkers. Not even his opinions antagonistic to Judaism could prevent their admiration of his genius. When, however, Averroes fiercely assailed Avicenna, Jewish authors are sometimes found to side with the latter as being nearer to Judaism; and Ḥasdai Crescas, who mournfully notes the havoc wrought in Jewish circles by philosophy through laxity of observance, vehemently denounces both Aristotle and his commentator Averroes. Crescas must, however, have been blinded by his zeal when he terms Averroes a mere chatterer. 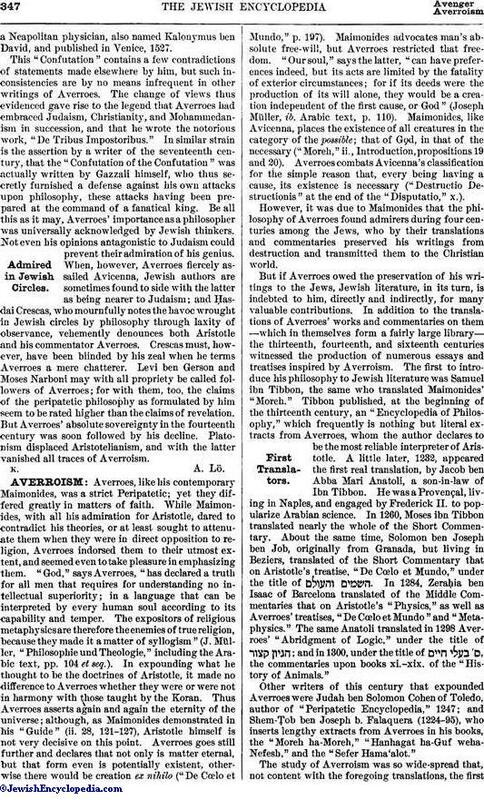 Levi ben Gerson and Moses Narboni may with all propriety be called followers of Averroes; for with them, too, the claims of the peripatetic philosophy as formulated by him seem to be rated higher than the claims of revelation. But Averroes' absolute sovereignty in the fourteenth century was soon followed by his decline. Platonism displaced Aristotelianism, and with the latter vanished all traces of Averroism.